The Canon 200mm f#2.8 prime lens gives remarkable performance for astroimages across the whole diagonal of a full frame sensor. I am using the lens with a Canon 5D MkII (unmodified) which means that I can capture star fields quite well, but not the faint red emission nebulosity – and I have a massive field of view of 10 x 6.8 degrees to play with (where the diameter of a full Moon is just half a degree). I also have a huge portfolio of faint deep-sky objects captured using the Hyperstar III – so I am now in the happy position of being able to grab huge star fields in one go using the DSLR and then filling in any faint objects using Hyperstar III data – a process called compositing. 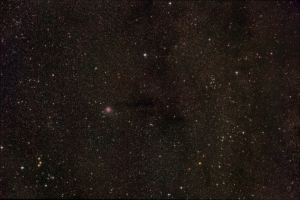 The image below is a 10 x 6.8 degree deep-sky image centred on the Cocoon nebula in Cygnus. Towards upper right we have open cluster M39, towards lower left is open cluster NGC 7209, and towards upper right is a large open cluster NGC 7243. 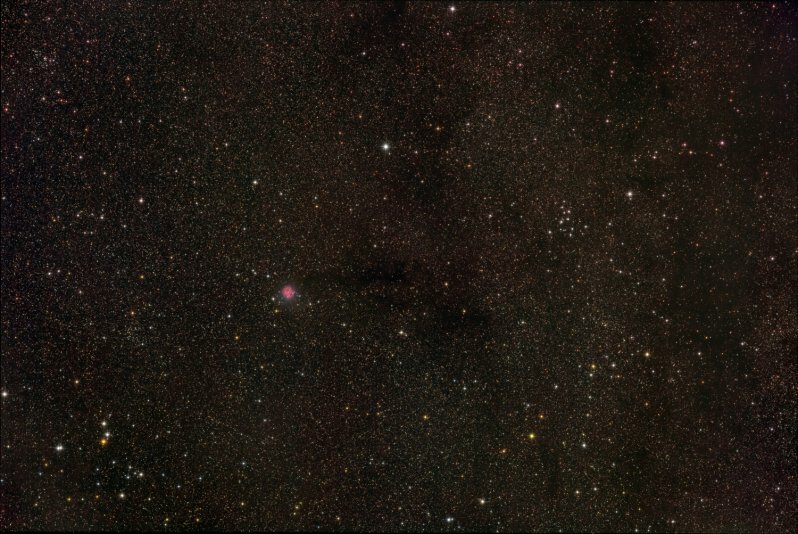 Trailing behind the Cocoon nebula we have the highly impressive dark nebulosity Barnard 168, one of the most high-impact naked-eye nebulosities in the northern hemisphere. The combination of the 200mm/Canon 5D MkII and Hyperstar III data is going to feature highly in forthcoming deep-sky images from the New Forest Observatory.